The ELBO values reported in the log file are supposed to be a smoothed version of the raw ELBO across sliding window average. However, in practice, If you look at these smoothed values rather than the tracked tar file one, one would get a distort impression of how the ELBO converges. They consistently underestimate the raw value which suggests that this is indeed a bug. The example below is kind of mild ... I have seem far worse smoothing with bigger depressed parabolas. 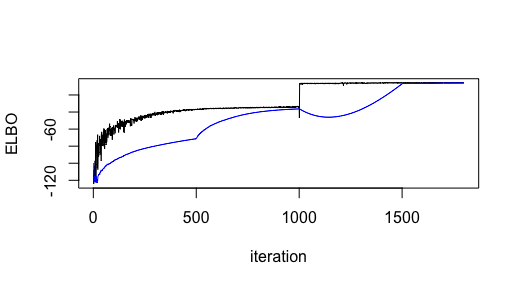 (as the one seen between iteration = 1000-1500). The black line is the raw ELBO and the blue lines is the "smoothed" ELBO reported in the log. The biggest worry here is whether the bug in calculating that average "smoothed" ELBO means that the stats used for convergence (i.e. sigma and SNR) are also miscalculated. In that is the case, It would probably result in postponing convergence thus it might have gone unnoticed as it would not have a negative effect in the results (unless there is some overfitting as a consequence).